Helsingor -den 15. 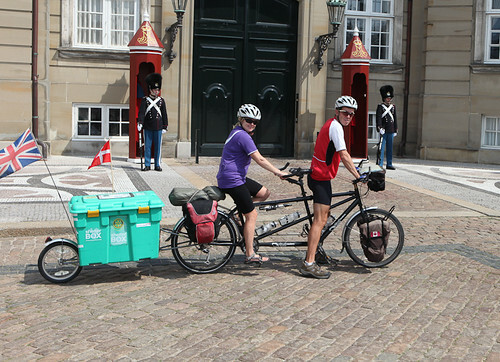 Juni: Henrik Svane og Steve Pikering fra Shelterbox Danmark modtog en donation fra Helsingør-Snekkesten Rotary Klub, som var en del af overskuddet fra deres Bil-lotteri. På foto ses Henrik og Steve sammen med præsident Vibeke Weber og en chek på 25.000 kr. ShelterBox Response Team (SRT) members, Rotarians and the Boy Scouts of America, have distributed emergency shelter and ancillary aid for families affected by the tornadoes in Arkansas. The ShelterBoxes were distributed on June 9 in Altus and Denning, Arkansas; two of the worst affected areas of the state which were devastated by the massive storm system that swept across the United States. It was the same storm system that lead to the tornado, the worst to hit American soil in 60 years, that destroyed much of Joplin, Missouri. SRT members Mark Dyer (US), Yi Shun Lai (US) and Tim Osburn (US) worked with members of the Altus Sunset Rotary Club to identify families whose homes were destroyed. The club helped to arrange a volunteer work force to assemble tents and distribute aid, including more than 40 Boy Scouts and leaders. SRT member Tim Osburn, completing his first deployment since graduating as an SRT member earlier this year, said the support from Scouts and Rotary was invaluable. SRT member Mark Dyer added: ‘This is the second deployment where I’ve worked with Scouts in the field, the first being after the Japanese tsunami earlier this year, both have been great experiences. ‘In temperatures that were over 90 degrees, they worked quickly to get families into disaster relief tents. The Scouts are always working hard and in the middle of so much devastation you can always count on them to put a smile on your face. ShelterBox has programmes in place working with Scouts in the UK and in the USA. To find out more about ShelterBox and Scouts in the UK click here. To find out more about ShelterBox and Scouts in the USA click here. Huw and Carolyn Thomas had a busy day in Copenhagen. They manged to dispay thier "box on a bike" at many of the well known tourist attractions adn then met a range of people from Rotary, Rotaract, the International Festival, British Chamber of Commerce and many by-passers at/outside the Marriott Hotel.The combined team put up the demo tent on the waterfront. Emergency shelter for close to 50 families is en route to rural Arkansas, USA. Families in the small, close-knit, rural towns of Etna and Denning had their homes destroyed last week when a tornado tore through them. 48 ShelterBoxes are en route to the worst affected areas and will provide shelter, warmth and dignity to families who have lost everything. ShelterBox Response Team (SRT) members Yi Shun Lai (US) and Tim Osburn (US) have been working with officials in the affected area. ‘In rural northwest Arkansas, where communications are spotty and folks are spread out, it’s easy to overlook pockets of the population that are in need of help,’ said Yi Shun Lai. ‘We’ve seen folks whose homes are reduced to rubble but who remain on their land for fear of losing even more. Tim Osburn was in Joplin last week and saw a direct connection between the type of destruction he saw there and what we’re seeing in the small towns of Denning and Etna. This year fierce storms, floods and tornadoes have hit the southern states hard. ShelterBox Response Teams have worked in Tuscaloosa and Joplin but the disaster response needs were being met by local authorities. According to NOAA (National Oceanic and Atmospheric Administration) 2011 is preliminary ranked 7th among the deadliest tornado years in US history. The tornado that struck Joplin was the worst to hit American soil in more than 60 years. A tornado is a violent rotating column of air that reaches to the ground from a storm cloud created and maintained by strong inflowing winds. Most continents have regions where conditions lead to development of tornadoes. In the US, ‘Tornado Alley’ stretches between Nebraska to Texas and Oklahoma. The tornadoes form here when cool air from the Rockies meets the warm, wet air from the Gulf of Mexico. This is the second time ShelterBox aid has been sent to the US with ShelterBoxes being distributed to families in desperate need after Hurricane Katrina in 2005.